The Marxist wants to turn swords into ploughshares, the capitalist wants to turn potatoes into crisps, and he doesn't care how much water he wastes doing it. Domestic water use is just eight percent of overall water consumption. Industrial use is the other major user of water. All products have a water component, often called "virtual water", to describe the volume used to make something. The annual global trade in "virtual water" today is said to exceed 800 billion tonnes, the equivalent of 10 Nile Rivers. Nestle, Danone and the Coca-Cola company (and Pepsi) have magically transformed a basic human need into a life-style choice. These companies are in the business of selling bottled water. Through their advertising they have persuaded millions of consumers that their bottled products are superior to water from the tap. In a temperate region like the UK some two litres of water are lost from our bodies each day and have to be replaced. The life-style peddlers would have us believe that what we need to do is replace it with their bottled water. Not true! The water content of the food we eat makes up about half of the water content we need on a daily basis. And your normal daily intake of tea, coffee, milk, beer, wine, etc probably makes up for the rest. If you're still thirsty, try the tap. Fact, there is simply no defense for buying bottled water, except as a one off, so you can acquire the plastic bottle, to refill from the tap everyday. Clearly, if you are intending to jet off on a fact finding mission to Haiti, to check up on the wealthy nations' lame efforts to support the desperate plight of the poor in that country, then take some bottled water. Staying here, you don't need to make a life-style choice, just a money saving choice. The capacity of the privatized water companies to deal with waste treatment is woeful. This is due in part to the Victorian infrastructure they are using to deal with the problem but it is also due to poor investment on their part. They are only interested in short term profits not long term improvements in water supply and treatment. Fact: the water companies are responsible for over 20,000 Combined Sewer Overflow pipes. These are used to cope with the pressure placed on the system by heavy rain fall and flooding, the alternative would be to have sewer waste coming back up dosmestic toilets. However, some water companies are using these overflow pipes routinely to dispose of waste and the Environment Agency is not bothering to check up on their activities; they prefer to use a system of limits on use and self reporting if limits are exceeded. It is estimated that at least 500 overflow pipes discharge directly onto or near beaches, exposing bathers to a high probability of disease. 1. What is your MP going to do about the water companies dumping raw untreated sewer waste into the sea around Britain's coastline, 2. under-investment on the part of the water companies, and 3. what are his intentions with regard to the limp attitude to this disgrace on the part of the Environment Agency? With the introduction of the 1989 Water Act, the ten Water authorities in England and Wales, which had previously been created under the 1973 Water Act, became private limited companies. The Water Services Regulation Authority (OFWAT) was set up to add legitimacy to the privatization project. OFWAT provided the regulation framework, setting out performance standards and targets, a cap on price increases being key. There can be few examples of other private companies throughout the world which have a regulator to ensure that they receive a set rate of return on their investment. This could be described as a prime example of corporate welfare. The Drinking Water Inspectorate (DWI) was set up in 1990 to monitor water safety and quality. The Environment Agency monitors river and environmental pollution. Nearly a billion people don't have good access to safe fresh water. In a single generation, that number could double as growing demands for water will exceed the available and sustainable supply by 40 percent, according a recent study. A lack of access to water can lead to starvation, disease, political instability and even armed conflict. Governments see their role as delivering water to the public and industry. This has to change to sustainably managing water resources for society and the natural environment. Policy-makers haven't treated water as a valuable resource and as a result water is wasted, with leaky water infrastructure losing 20 to 50 percent of the water it is supposed to deliver. Even water-poor countries in the global south don't make water a top priority because water availability is mainly an issue for women and the poor and they are not well represented in government, she said. Instead limited public funds are spent on things like the military and other priorities. U.N. Secretary-General Ban Ki-moon urged governments to make pro-poor investments in water and sanitation, particularly in urban areas where the need is acute and has grown by 20 percent in the last decade. This is "a crisis of governance, weak policies and poor management, rather than one of scarcity," Ban said in a statement. As the world population and economy grows, the water challenge becomes all the greater. By 2030 the global water demand will be 40 percent greater than today's "accessible, reliable, environmentally sustainable supply" according to the U.S.-led study "Charting Our Water Future" by consultants McKinsey and Company. About one-third of the population, concentrated in developing countries, will live in basins where this water deficit is larger than 50 percent, the report found. Agriculture accounts for approximately 71 percent of global water withdrawals today and the water challenge is closely tied to food provision, the study notes. Inefficient and inappropriate irrigation accounts for much of this water use. Thirsty crops like maize are grown in dry places like Spain, requiring enormous amounts of irrigated water. Even a low-value crop like sugar cane is grown under irrigation in some places, which Catley-Carlson calls "ludicrous". Poor policies, subsidies, such as those for biofuels, trade agreements and bad habits are collectively responsible for much of the world's water misuse in food production, she says. 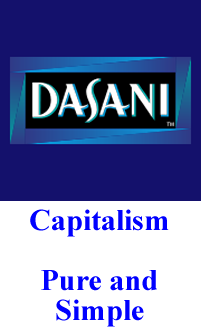 In 2004 Coca-Cola launched a new bottled water brand, Dasani, in the UK. Grocer Magazine blew the gaff, or was it a con, the water came from Thames Water Sidcup, south London. That's right, tap water. Coca-Cola's treatment process was examined and the water turned out to be decidedly unhealthy. The water contained traces of bromide which was not there before Cola started messing with it. Richard May, Chief Publicity Officer of Dasani, said he "was disappointed that the water had not been more successful". Er, it might have sold better if it wasn't from the Sidcup Spring and not tainted with a carcinogen, you prat? "Peak water" has already come and gone. Humanity uses more water than can be sustained, drawing on non-renewable reserves of water accumulated over thousands of years in deep aquifers.